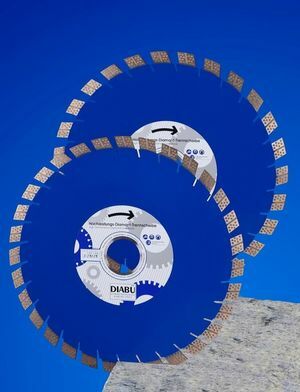 DIABÜ® Diamond Tools expands the product range with the new Saw Blade Kera Line. 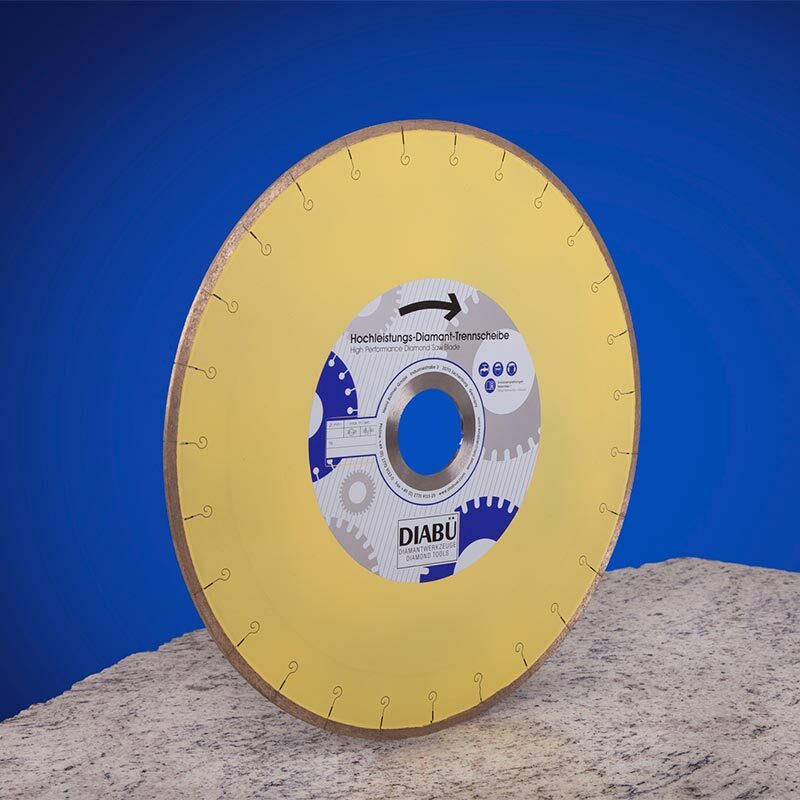 The saw blade is distinguished by a special toothing, which is designed as a full continuous ring and is thus particularly suitable for cutting of extreme hard and rough materials such as Ceramics, Asprolit Glass Stone, Glass Ceramics, Dekton, Stoneware and Neolith. For the specially designed segment geometry a further developed metal bond with very sharp diamond crystals is used. The very sharp diamond cutting edges ensure a clean and particularly sharp cut at the upper and lower cutting edge. The blade is therefore ideally suited for the separation of very hard and break-sensitive materials without fractions, with low pressure and low stress. Due to the stable core, miter cuts can be carried out without problems. The blade can also be supplied with 2 reinforcing flanges. The flanges are glued on both sides and stabilize the silent core, the silent blade becomes even quieter and leads to an excellent cutting result with a sharp edge. Deviating dimensions on request possible. 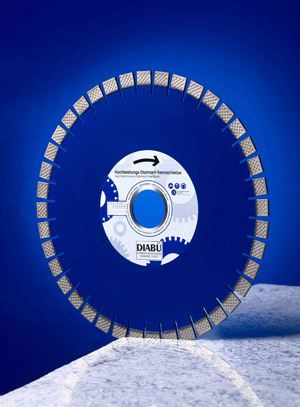 Especially for the new CNC bridge cutting saws DIABÜ has developed an extremely, robust and easy cutting saw blade. Along all the axes we achieve the highest cutting precision. No matter, if angle cuts or curves – the new AXIS succeeds in all of your requirements. The new multi-wire with saw beads of diameter 7,3 mm do have the following features: Easy cutting quality with special high load carrying wire out of steeland long-term flexibility plastic coating. High durability, no wire breaks. High quiet running when sawing, low vibration sawing, very gentle for machines and equipments. 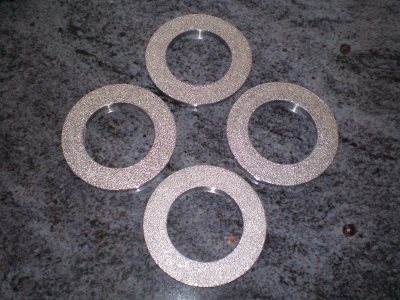 Excellent cutting- and surface quality of the plates. The multi-wires are available endless spliced or closed finish. 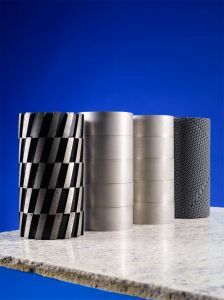 Our CNC-grinding roll programme has been expanded by sintered diamond rolls, which have an essential longer durability than electroplated tools. Better constant grinding features realize a constant high-grade grinding result. Furthermore the successive rolls will be treated softer, as the material removal is more accurate and constant. For the graining #200, #400 and #800 now we have Ceravex grinding rolls in our programme with a new developed resin system with excellent wearing features and considerable higher running times than rolls which are bonded with Dia-sheet. Great cost reductions are possible, as the running periods could be increased by a wide margin. Extreme high durabilities compared with constant very good material removal: Our new Ceravex planet tools for the surface and edge grinding Dia 100-130 mm, Ceravex chamfer grinding planet for the chamfer (2 grainings for anexcellent brilliance), long-term running time and only a little sludge. Ceravex grinding bars/rails for grinding machines (less grainings, longer durability). We improved our RED Line Laser Titan by a better cutting performance, i.e. 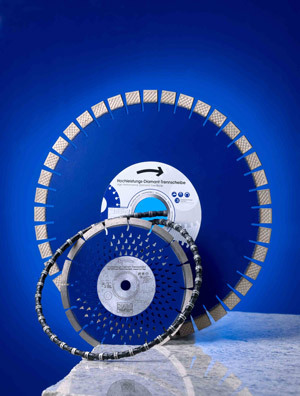 this saw blade convinces by an excellent cutting efficiency and security. Lasered segments perform all safety standards and protect the consumers. You will get a tool you can rely on! We have again invested great efforts in new developments and technology. 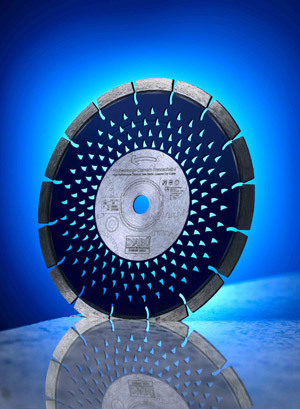 The laser welded saw blade Red Line Titan could achieve excellent sales figures. The laser technology for wet cutting saw blades in the natural stone market meets the spirit of the time. To be also competitive in the wire production in future, automated handling systems are used in all production fields today. Consistent further developments of the wire design promise increased cutting speeds and improved output at the same time. 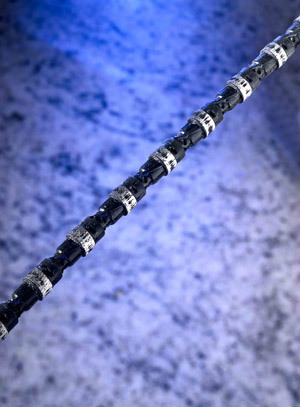 Just now DIABÜ® has presented its new DIABÜ® HELIX diamond wire which is mainly used in quarries at the moment and could achieve excellent results in productivity. The cutting speed has been increased by more than 80% due to more powerful machines and at the same time a higher tool life by nearly 20%. 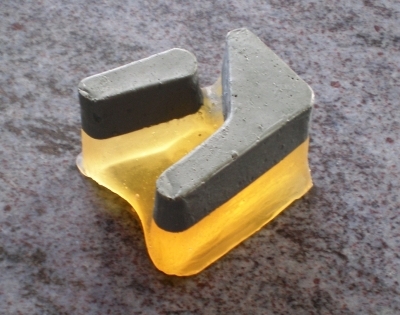 New production methods as well as improved vulcanization technique are responsible for this achievement. 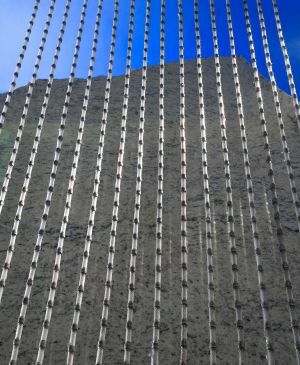 The wire is moreover characterized by a new design and thus improves the flexibility and robustness during difficult cutting conditions in the quarry. The new injection-mold design additionally contributes that both the carrying wire and the bead are coated at a optimum. Due to this improvments the wire runs with low vibration, achieves higher cutting speeds and wears off uniformly round, as a result the wire life increases quite a lot. 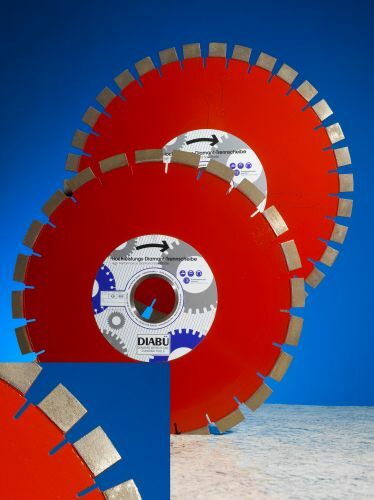 For the use on multi wire saws the new dia 8mm DIAPERL® KUF wire has proved its performance. This wire has highly compressed beads which are strong fixed with special springs and plastic injection molding. The wires of multi wire saws in particular need to be very smooth and unproblematic which can be achieved here by the special construction. More than 10 years ago our first titan saw blades were placed on the market. Now the enhanced saw blades with new segment design tie up to the success of the laser welded Red Line Titan saw blades. The easy cutting performances are guaranteed by a controlled and reproducible segment production and the use of high-quality metal powders concentrated with premium diamond grits. Due to a complete new sintering technique segment designs can now be sintered for the first time which were unthinkable up to now. 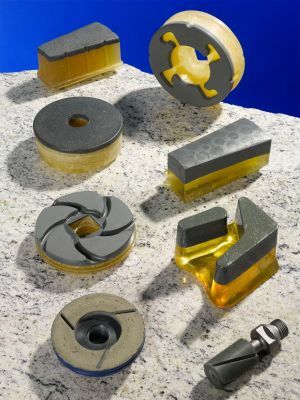 Thusly produced tools not only have a very high brand recognition with its relief-like heightenings and depressions on the segment sides but open new possibilities to enhance the application characteristics with regard to friction, wear and tear, cutting parameters and noise development. The new segment design has the idea to use natural structures like e.g. fish skin or reptile skin following the nature (bionics) for diamond tools for the first time. The special construction of the fish skin has the effect that the fish swims flow- and friction-optimised through the water. In the field of dry cutting DIABÜ® presents the new dia. 230 mm laser welded saw blade „Shark Skin“. This saw blade is located in the premium sector and characterized by an innovative core design and a new segment alloy with high-strength diamond. Optimal cooling, excellent easy cutting performances in many materials and a very quiet high-performance saw blade with good tool life are the results. The blade was checked in detail by MPA Hanover and meets the safety requirements according to EN 13236. Nearly 10 years ago DIABÜ® started the design and development of its own grinding rolls. 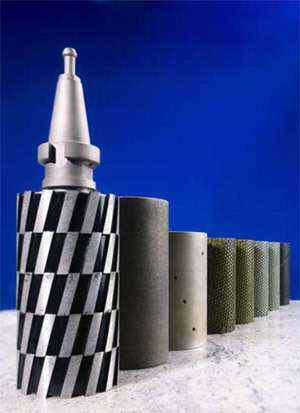 The product range has newly been expanded by sintered grinding rolls alternatively to the previously common galvanic rolls. The sintered rolls improve the polish once more and increase the possible tool life substantially. Some rolls are already running nearly 10 years ! The dimensions of the rolls can be individually customised . In practice mostly rolls with diameter 100mm and lengths of 200mm and 240mm are used. A clear tendency is to buy a 2nd tool kit with 160mm high rolls to be able to process also thin slabs continuously. Modern CNC grinding machines have sufficient tool spaces available to take up these tools into the magazine. At Stone+tec 2007 DIABÜ® presented the first time the new Ceravex grinding bricks to the customers. The main focus during the development was put on the previous disadvantages of the synthetic resin bound diamond grinding bricks for grinding lines and single head polishers. The tool lifes of synthetic resin are mostly still too low and the polish in comparison with mineral bricks not yet optimum. With the new Ceravex grinding bricks 2000 m² with 5 bar grinding pressure were achieved for the grinding grit 220 after the last metal-bound diamond grinding brick on a grinding line. The polished slabs did not display any scratches. As the stations with the mineral grits 180, 220 and 400 have the most abrasion in practice, this brand-new application will focus on these stations at first. as a Frankfurtshoe for natural stone and engineered stone (artificial high quartz materials). high concentration. The high tool life minimizes machine breakdowns and the grinding costs will be reduced considerably. DIABÜ® expands its product range about the new LPS-Line grinding tools. It is a technology of „Liquid Phase Sintering“. The tools and its diamond crystals provide excellent work characteristics in dry and wet grinding. These new LPS tools combine the quiet running of grinding tools with continuous ring and the fast grinding of turbo grinding cups. The amazing cutting rate and good tool life is a result of a high concentrated and tough bonded diamond grit. The grinding cups are available as grinding No. I + II for natural and engineered stone. They are suitable for surfaces, angles and chamfers. Despite the abrasive grinding characteristics the edges remain sharp.